Driving north out of Steamboat Springs, the Yampa Valley’s true Western heritage and wild wilderness ease into view. Through rolling ranchlands and dense pine forests, small, historic towns like Clark and Hahn’s Peak lead the way to Steamboat Lake, a vast recreation area with no shortage of fun activities for the whole family. 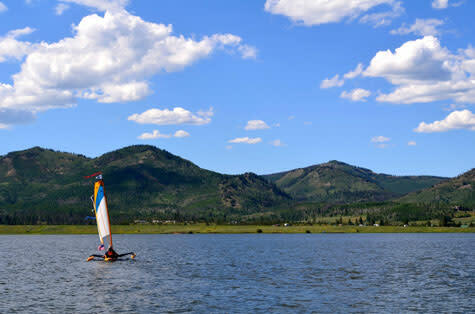 With the stunning Hahn’s Peak always in view, boating, fishing, waterskiing and other watersports are all great ways to enjoy a day out on the lake under the Colorado sun. In the winter, the frozen lake is ideal for a snowmobile ride or a cross country skiing adventure out to a fishing hole, where the well-stocked lake still offers up beautiful trout. Friday to Sunday 8:00 a.m. – 6:00 p.m.
Monday to Thursday 8:00 a.m. – 5:00 p.m.
Daily 8:00 a.m. – 4:00 p.m.
Open Memorial Day weekend to mid-September, the marina hours are 8:00 a.m. until around 7:00 to 8:00 p.m. The marina offers boat rentals, dock rentals, and fuel, along with fishing licenses, bait and tackle. The marina also has a convenience store with homemade deli sandwiches and their famous fudge. From Steamboat Springs go west on U.S. Highway 40 to Routt County Road 129. Turn right and drive north 26 miles. Make a left onto Routt County Road 62, and another left to the entrance gate.